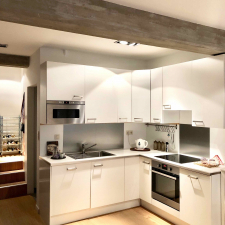 Brussels (Ixelles)-Wonderful groundfloor apartment loft style with garden to sublet 75m2, fully RENOVATED and FURNISHED, high quality finishings, with private garden. Close to the most beautiful park Bois de la Cambre, trendy Place Flagey and the remarkable ponds of Ixelles. Located in small apartment property of 3 floors. Short term rental (6 months to preferably 1 year). Ideal for expats staying short period or people looking to buy/rent a definitive place later. Features: entrance hall, separate toilet, luminous living room with access to garden, fully equipped kitchen (glassware and cookware included!). Lower level: bedroom, bathroom, storage/dressing area. Double glazing, wooden floor. TV, intercom, Wi-Fi. Outdoor parking space. Private garden 35m2 with terrace south west. Available 1st of April 2019. Charges €165 (water, gas, electricity, WiFi). Rent €1025. For more photos, details and visits, please contact Gaétane Caluwaerts: gaetane.caluwaerts@skynet.be or +32 497 29 91 57‬.